Exterior of Fukutake Hall, The University of Tokyo, Hongo Campus. 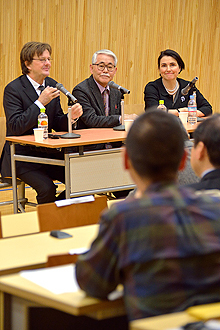 On 7 December 2013, for the first time in its 15-year history, the Sainsbury Institute hosted a major cultural event in Japan – the first Ishibashi Foundation Lecture Series, Euro-Japanese Exchange in the World of Creative Expression. Since its inception academics associated with the Sainsbury Institute have been invited numerous times to teach, give lectures and to participate in symposia and workshops in Japan. The Institute has co-sponsored events in Japan with prestigious organizations such as the Japan Foundation. As a result, over 15 years we have become a well-known and respected name within academic and artistic circles in Japan. However, we have always been aware that more could be done to help create an impact in our field. Consequently, we realized that as a British-based organization promoting Japanese arts and cultures abroad, our mission should not be confined to promoting Japanese arts and cultures only outside Japan. We can also demonstrate to Japanese people how their arts and cultures are interpreted outside Japan. These concerns led us to develop a project that brings prominent academics and museum related professionals based in the UK and Europe to Japan. In Japan they would deliver lectures that focuses on what Japanese arts and cultures as perceived abroad can offer to Japan, and how Japanese arts and cultures are interpreted in European museums. We are incredibly fortunate that this concept was enthusiastically received by the Ishibashi Foundation in Japan. The Ishibashi Foundation agreed to not only sponsor this lecture series but also allowed us to name the series after the Foundation. The Ishibashi Foundation was created by Mr Ishibashi Shojiro, a leading industrialist who established the world famous tire company Bridgestone. Ishibashi Shojiro is also renowned for his cultural activities such as laying the foundations of several important museums in Japan. Currently, led by his grandson Mr. Ishibashi Hiroshi, in addition to running two museums in Japan, the Ishibashi Foundation has a grant programme that supports outstanding artistic, cultural and educational activities both in and outside Japan. 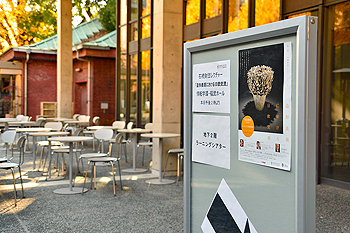 Ishibashi Foundation Lecture poster outside the Lecture Theatre. For the first year of this new lecture series we decided to emphasise visual artistic culture, which is one of the main research strands of the Sainsbury Institute. For our first lecture we chose two academics who are both associated with major museums in the UK: Professor Paul Greenhalgh, Director of the Sainsbury Centre for Visual Arts, the museum of the University of East Anglia, and Professor Nicole Coolidge Rousmaniere, Research Director of our own Institute, who is currently seconded to the British Museum as curator for Japanese arts. To fully engage the audience we realized that we would need a distinguished commentator and moderator who could guide the debates after the two lectures. Professor Osano Shigetoshi, a prominent scholar of Italian art history in Japan and Dean of the Faculty of Letters and Graduate School of the Humanities and Sociology of the University of Tokyo, agreed to take on this task. Last but not least, an appropriate venue was crucial to the success of the event. We wanted to host the lecture in an accessible and beautiful environment that would be at the same time representative of the academic calibre of the event. The Fukutake Hall at the Hongo Campus of the University of Tokyo, designed by the world famous architect Ando Tadao, was an ideal venue. We managed to secure this beautiful wood-paneled hall situated in the basement of the serene but elegant contemporary building. A typical winter day in Tokyo is bright and sunny and fortunately the Saturday that we chose for the first lecture was just such a day. 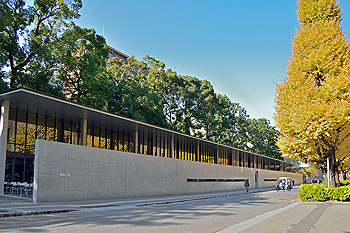 The Hongo Campus of the Tokyo University is famous for its ginko tree-lined boulevards. As global warming has advanced in Japan, the changing of the colour of leaves starts much later in the year. This year, in early December the ginko trees had not yet shed their leaves. The enthusiastic members of the audience who joined us for the event were welcomed by the bright yellow leaves of the ginko trees that stood tall against Tokyo’s blue sky. Professor Nicole Rousmaniere giving her lecture. 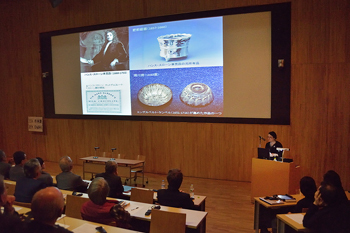 The second lecturer, Professor Rousmaniere, employed her extensive knowledge of Japanese art and rich experience as curator at the British Museum to introduce how Japanese objects are perceived and displayed outside Japan using the British Museum as a case study. The first image that Professor Rousmaniere showed was one taken from the current display at the Mitsubishi Corporation Japanese Galleries. The audience was shown a central case in which a Kofun period Haniwa (5th -6th century) and a contemporary porcelain work by the artist Hosono Hitomi, entilted Large Feather Leave Bowl, are displayed side by side. Next to the Hosono vessel label is an image of a Middle Jomon Period flame vessel (c. 2500 BC) from Nagaoka. The reason why these vessels were placed together was revealed at the end of the lecture. The explaination was that even though five thousands years separates the births of the two objects, the Hosono and the Jomon vessel, there is a distinct resemblance between them. The image of the Jomon pot did not seem to directly inspire Hosono Hitomi, but there are provocative resonances. Additionally, the fact that the creator, Hosono, studied in Japan, Denmark and the UK, and now resides in London and employs a Wedgwood technique to create her objects, makes her a truly global artist. In her subconscious she may have remembered the unique shape of Jomon pots, which can be seen in history textbook used at Japanese elementary schools. Importantly though, the modern work created in 2013 faces visitors as they enter the galleries. The fact that this very modern work is displayed with early ceramics in the same cases allows the viewer to see Japan present and past, past and present as a continuum of innovation and creative expression. This story of how Japanese art objects transcend both geographical boundaries and time is a tale that is now told at the Japanese Gallery of the British Museum. and Nicole Rousmaniere at the panel discussion. The two excellent lectures sparked a post-lecture discussion brilliantly moderated by Professor Osano. Questions ranged from what could be the answer to Professor Greenhalgh’s final question on what could be the next artistic movement that Japan could help realise, to the significance of the system of Living National Treasures, which was the theme of a very successful exhibition that Professor Rousmaniere curated at the British Museum. The Sainsbury Institute will be posting the lectures on our website so we hope that this short article has whetted your appetite and you will access the content once it is available. It is up to the audience to judge whether our initial attempt has been successful. Probably one set of lectures is not enough to make a decision. Fortunately, we have been allowed by the Ishibashi Foundation to plan a further two sets of lectures for the series. Our goal is to create a publication after the three year run of the lectures. While the Institute will continue to enrich its activities in the UK and Europe, we would like also to see if we can build up a strong support base in Japan.